"For the benefit and enjoyment of the people..."
This is the arch at the North Entrance. It was dedicated in 1903 when Theodore Roosevelt laid the cornerstone. It was designed by Hiram Chittenden (who also designed the original Fishing Bridge and the Chittenden Bridge - which was replaced in 1962 and named the Chittenden Memorial Bridge). It was built for the cost of $10,000. Besides the Old Faithful Inn this is probably the most well known man made structure associated with Yellowstone. This is a headstone in the Gardiner Cemetery for Marie Douglass from Nebraska. She died when she was 9 years old as she traveled through Yellowstone in a covered wagon. It would be interesting to know more about her and her family. A view of Gardiner, MT and the North Entrance with Roosevelt Arch. This picture was taken from the Gardiner Cemetery. With it being BLT night in the EDR I didn't really expect the evening to get much better. But life is full of little surprises and I found out that BLT night can get better. Just north of Roaring Mountain I saw The Magnificent One standing off from the road. With the rain this evening all the thermal features were showing off their gassy vapors and the stream that was flowing in front of him was steaming, making the sight very majestic. Just beyond him I spotted a huge bull elk grazing on the hillside. I can't imagine having to maneuver through the trees and underbrush with those huge antlers. Another great sight I have been seeing lately is the herds of bison in the morning in Hayden Valley with steam rising off of their backs as they stand in the sunshine. I have wanted to take a picture of all the steamy bison but I'm just not sure if a picture would actually capture the true look of it. I guess the next time I'll just have to get the camera out and give it a try. A dorm mate has reported hearing elk bugling throughout the night from her dorm room. She also simultaneously heard wolves last night. I must of slept through it but that would be a great sound to hear at night. have these huge elk antler arches. Last evening on my way back from Fishing Bridge I did get to see another coyote in Hayden Valley. This one was right off the road heading toward the river. Some of the coyotes I have seen in past years seem a little ragged but so far the ones this year look sleek and healthy. It was getting dark so I just watched him for a few moments and I didn't even bother to try and get a picture of him. Lone bison bulls seem to enjoy being right next to the roads and create quite a traffic slowdown. Between Hayden and Fishing Bridge I came to a two mile crawl as everyone slowed down to see a bull standing on the edge of the road chewing his cud. I've noticed lately that ambulances and the drivers are stationed by them as the driver waves those orange sticks to keep traffic moving. I have no answer as to why they have the ambulances there.....maybe in anticipation of a wreck with the traffic. An incredible scene this morning. I was coming back from Hayden Valley when I saw a herd of elk in the Yellowstone River. It was right across the river from a picnic area so I pulled in and grabbed both of my cameras. When I got out of my car I could hear one of them bugling so I stayed amongst the trees and used my zoom. Unfortunately, two other guys pulled in and hurried right up to the rivers edge and scared the herd away. When I turned around I noticed that the entire parking area had filled up and even a couple of NPS employees had pulled in. Too bad that the rest of the people missed most of the sights and sounds of the herd. This is the view coming up to the Canyon Junction from the south. Sometimes the road is filled with cars and people from the junction to nearly this spot when the bison or the Boys of Summer are in the area. Black bears, grizzly bears and wolves can also be seen in this area. And with a keen eye a person can also spot the elusive Yellowstone General Store employee. This is a picture I took of a grizzly jam I was in by the Grizzly Lake trailhead earlier this year. I used my side mirror to catch the cars behind me, there were many more in the front of my car. I was in it so long that by the time I moved up to the area that the grizzly was in it was gone. I did use my time wisely, I cleaned and organized my car. Here is a fella that anyone who has been to Yellowstone should recognize. The other night I was sitting by the Yellowstone River doing some paperwork when this Raven flew in and then sat and stared at me. They are huge and noisy birds and extremely intelligent. At a ranger talk one of the rangers touched on the topic of the ravens. He told stories of how these birds have swooped down and stole sandwiches, credit cards and cell phones right out of unsuspecting hands. I'm not sure as to why people were waving their credit cards around outside but I'm sure they regretted doing so as they watched their card fly out of sight in the grasps of one of these huge birds. Today at work I started with stocking gifts and then was moved to the register in groceries. One of the readers of this blog stopped in to say hi to me. He was here from Las Vegas. Unfortunately, I was not able to visit long. I had just moved to the register and in one of my 'everything must be clean' moments I dropped the bottle of cleaner on the floor............twice. There is an obvious reason why it was a good choice on my parents part not to name me Grace. So between moving to the register, cleaning up liquid cleaner (a clean freaks dream!) and grabbing my supply of bags I had to cut short my visit with him. But I do thank him for taking the time to stop in and see me. I did swing through Hayden Valley this evening. I got to watch a coyote trot along the edge of the Yellowstone River. He seemed to just meander around but I'm sure that his intent was to find a nice fat rodent for his dinner. He finally disappeared into the brush and I moved on. I did get a chance to snap a couple of pictures of him. Both coyotes and wolves can be heard from our dorms singing at night. Great sound. With it getting darker sooner I usually can't stay out very long. I really have an avertion to driving at night especially with the bison on the move. But coming up to the north through the valley it is quite a sight to see the ribbon of headlights weaving through the valley. I could even see headlights coming down Dunraven Pass when I looked up to the mountains. The Dorm Bison has been around. There is actually three of them but only one is usually by the dorms at a time. Today two of them showed up together so I might have to pluralize to Dorm Bisons. Of course they stopped traffic. I haven't seen the Boys of Summer lately but there have been a nice herd of elk in the area. Maybe they have hooked up with some these ladies to form their harems. I'll have to look closer to see if any of them in the herd have antlers. I just finished the book Death in the West by Chris Becker. It was a good read. Last week I finished The Oatman Massacre by Brian McGinty. Excellent. Now I am reading Pioneer Women by Joanna Stratton. And if your interested, I finished up the Suicide or Murder book about Merriwether Lewis and I have to vote for................murder. It's an odd day when I manage to squeeze in two posts considering how hard it has been up to this point to get in two posts a week. After dinner I decided to head down to Hayden Valley. I knew I would only be able to go into the valley from the north a short distance. Each evening Grizzly Overlook is loaded with people watching for wolves across the river. I managed to pull into a pullout which was not occupied. Scanning across the area I saw movement on a distant hill. It was two wolves milling about!! I had to look around me because I could not possibly be watching two wolves all by myself. No one was around, it was just me! I had armed myself with my two sets of binoculars and Spot. Unfortunately, my tripod was still attached to my video camera from the party Monday night (my less than brilliant idea to actually film myself dressed as a banana.........what was I thinking?!) and it was still tucked away in my room. So the best I could do to zoom in on the wolves was to prop Spot on my steering wheel. Alas, when using that much zoom the slightest movement is magnified and after a few minutes I could of used a good dose of Dramamine. So alternating between Spot and my binoculars I managed to watch the wolves for about 20 minutes. I also scanned the hilltops and I saw that a few people from Grizzly Overlook had moved across the road and up onto a hill. I had to tee hee a little because they were all facing the wrong direction because the wolves I was watching was to their backs. But who knows, maybe they were all watching a pack of wolves and laughing at me for parking so far down the road. But I had my own private wolf show. If bison had blogs I wonder what they would write about us. Ok Jack, you have been officially named in my blog. Not only that but here is a picture of us from our Christmas Eve in August party. On my trips north of Norris I couldn't help but notice that the Magnificent Seven herd has been reduced to the Magnificent One. So I have had to change the whole meaning of the word 'one'. The bison in the Park are on the roam and I am finding them, alone and in herds, in places that I have not seen them this summer. Between Canyon and Norris has been a notorious 'dead spot' for me and my quest for wildlife. But the other day I actually got in a bison jam there as a herd wandered up the road toward Canyon, quite possibly the herd that I've seen north of Norris these past couple of weeks. Even heading up Sylvan Pass from Fishing Bridge I came across a loan bull standing by the side of the road. It is quite thrilling to see them in as they head toward new ground but it does also mean that extra caution should be used when navigating roadways in areas that before saw no bison. The bison are still causing a stir in Hayden as they stand right next to the road. Lots of cars are pulling over and people wandering around to snap their pictures. To be honest at times I have that 'been there done that' attitude but generally I am in awe of the huge beasts and I always sneak a peak at them as I drive through. Though the Park is less crowded I am still willing to wait another week or so to actually pull over and join a few people to watch. Still too many people for my taste. Occasionally I find a quiet spot to watch from a distance, both bison and people because people are the wildest animal of all. Also new these past few days are the snow markers being placed on the sides of the roads. It's kind of eerie to see them go up. They are being put up at this time because there are actually more park workers to put them up now instead of waiting later in the season. It feels like they just came down so it shows how fast time goes. Yesterday I had to drive a coworker to West Yellowstone. She had sustained some facial injuries and had to leave for home (a family member was meeting her in West). We are sad to see her leave under those circumstances. Last night was the annual Christmas in August program. We celebrated Christmas Eve with tons of snacks provided by all the employees and then we all watched the program which was also put on by the employees. The recreation room was decorated for Christmas beautifully. A few groups put on skits and some sang songs. A group of Chinese workers sang a few songs including a song for Chinese New Year and handed out Chinese New Year Cards. Very nice! One group sang the 12 Days of Christmas using items from the store and my group did a skit about bananas. I got up and read a poem about bananas and I had made a costume of a 5 foot banana with a cutout for my face. The rest of the group wore huge yellow cones on their heads. It was a lot of fun. We played games and then we all got presents (sweatshirts, mugs, t-shirts, etc.). Today we are having a Christmas dinner in the EDR and we are all wearing our battery-powered flashing Santa hats at work. The huge moose (you know what I'm talking about if you've ever been in the store) will even be decorated today for Christmas. We all are to wear Christmas shirts if we had one. I made one but I am now wondering if it really was a good idea to have sewn the little red bows with bells all over it. I guess I will be jingling through the store. Merry Christmas in August to everyone! Internet, sweet internet. I haven't been able to access Blogger lately, thus my lack of postings. But I am currently sitting in my sweet new room and using my very own computer to post this. Out of the blue my computer finally hooked up to the internet -- and it only took 3 1/2 months! And my new room I mentioned is because of a new position that I have: Dorm Lead. I am now responsible for the dorms (though no cleaning responsibilities) and what goes on in the dorms. I will still work in the store with new hours: noon until 6:00 and then I will spend 2 hours attending to dorm duties. Yup, my new room is a step up from my last. Though it looks identical to my previous room it does have one thing the last one did not have....a private bathroom! Hayden Valley has been a rush of activity lately. Earlier this week a bison carcass was about 50 yards off the road. Tons of people have been sitting on overlooks (much of the roadway has had cones put up to prevent parking jams) watching as grizzly bears and coyotes feasted at it. Though the carcass is pretty much gone there has been quite a bit of grizzly activity in Hayden. I have not heard much about the wolves. The bison have also taken to areas around the road lately. Another traffic jam concern. I have turned around before getting into the valley a few times after seeing car after car lined up behind bison covering the roadway and seemingly in no hurry to leave. I made it through the valley a couple times this week and watched a bull bison pawing dust up from the ground and hitting his lovely lady in the face with it. It looked a little comical. With the road closed for the year between Norris and Madison the roads are pretty congested with traffic this week. It should be slowing down with the approach of schools starting. It does make for a long drive (2 1/2 hours generally) to make it to West Yellowstone from Canyon. The store is getting ready for the annual Christmas in August celebration. On August 25 we will celebrate Christmas complete with Christmas attire (including sparkly Yellowstone Santa hats), decorations, a feast and then a Christmas show which will include snacks and employee skits. I am in 2 skits and I will also present a video that I have made which shows all the pictures I have taken of employees at work and at play. Everyone is looking forward to it. And I certainly cannot sign off without letting you know about Carl returning. 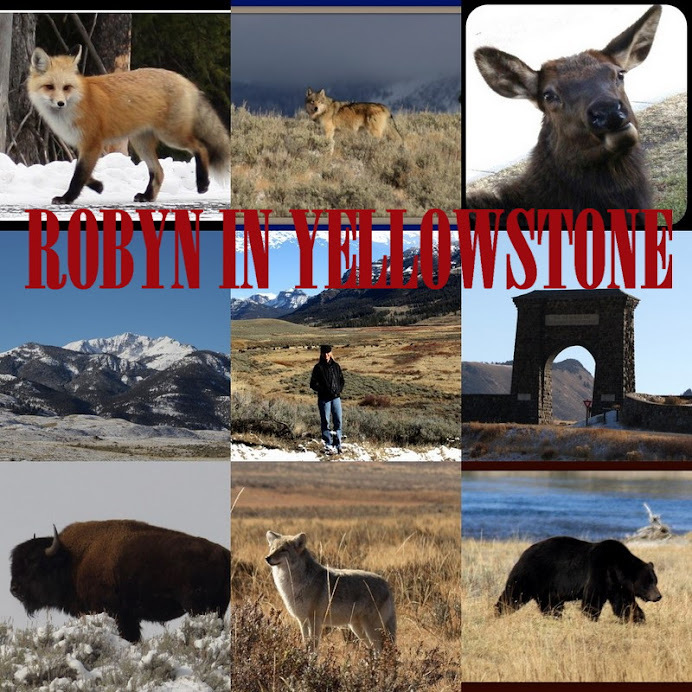 He was able to come back to Yellowstone and he arrived here this afternoon. Everyone is very excited about having him back and I know he is excited to be back. His huge grin on his face when he exited his car said it all. Welcome back, Carl! A friend of mine was in the Park and I met up with her in Mammoth this morning. I took her to Lamar to watch the bison as we ate a sandwich on an overlook. Even from quite a distance we could hear the huffing and puffing of the males and they tried to keep their lady away from the others. We stopped in Gardiner and I brought her to the old cemetery there. Old cemeteries hold a fascination to me. They can tell you a lot about the community and the people from times past. After picking up her car she followed me back to Canyon via Dunraven. It's always nice to visit with old friends. The elk herd in Mammoth has been getting a lot of attention from the visitors lately. They have been hanging around the area (as usual) and keeping the rangers busy. They had to put up orange cones and yellow tape around wherever the elk find a good napping and grazing area. People are lining the streets with cameras aimed at them as they munch away at the grass. A few days ago on one of my travels over Dunraven I came across a tow truck backed up to the edge of an overlook. It seems someone had gone over the edge. From my understanding it wasn't too serious of a situation but I'm sure whoever was in that car had quite a scare. Also, a few days ago, it was reported to me, that a car launched over the edge of the Shoshone Overlook. It unknown to me how that ended up but with the word 'launched' it couldn't be good. Right before the weekend a car hit a bison on the road between Fishing Bridge and Hayden Valley during the evening. The bison is dead and the car totalled. Traffic was held up for over 45 minutes and they were finally able to pass by the bison still in the road. One guy thought it was so interesting on his first pass that he turned around to go back for a second look and he actually hit the dead bison with his car and flattened (and possibly more) both front tires. Since bison have eyes on the side of their heads there is no reflection that can be seen from car headlights so it is extremely important to drive slowly and pay attention when driving in the Park at night. The big news from here is that President Obama is scheduled to be at Old Faithful on Saturday. A few of us employees are in 'just in case' mode and will be bringing our cameras to work that day......just in case he swings on in to Canyon to see the falls........and take in our sidewalk sale that we are having. Both the Dorm Bison and one of the Boys of Summer have been hanging around the dorm the past few days. It's quite a feeling to be sitting outside enjoying the afternoon when suddenly a 2,000 pound bison rounds the corner. Or a huge bull elk with a rack comes wandering by. With my last day on the early shift I knew it was the perfect night to drive the north loop last night. The weather has been rather cold lately (56 degrees yesterday) so I bundled up a bit and took off. It was rather uneventful with a few drizzly spots along my way to Mammoth. I took a few pictures of vistas that I have in the past figured I would take a picture of in the future. Just past Floating Island Lake I saw a beautiful black wolf just off the road. He was marking his territory and wandering around acting totally oblivious to those of us watching him. It had been quite awhile since I've seen a wolf even though there are regular sightings in Hayden. My wolf sighting really made my evening. I passed a couple of bear jams (I am assuming they were looking at bears because of their location) but I just kept cruising along. Later in September and October I will do more stopping when I won't have to battle with crowds. It will be like this spring when I was able to watch a bear by myself or with just a couple other people. Like I mentioned the Park is rather chilly. The surrounding areas are much warmer but with the elevation here it is a bit brisk during the days. Last night it was to get down to 33 degreees. I'm glad that I made a few sweatshirt purchases this summer as they are really coming in handy right now. One of the Boys of Summer, the hare, the pine marten, a mule deer and a few ground squirrels have been by the dorms. And it is the simplest of the animals that amuse me........the ground squirrel. They scamper around and every once in a while they rise up and shout out their warnings to other squirrels in the area. I guess I'm not worth a warning as they pretty much ignore me as I come out to watch the squirrel families. An old grizzly (approx. 25 years old) has been seen at the Canyon RV Park. According to the rangers he has been forced out of the mountains by younger grizzlies. He is pretty battered up and his face is scarred (thus the Scarface name he has been given). He has been behaving himself just the occassional sighting as he passes through......until yesterday evening at aobut 6:30. Two of my co-workers were walking down the road in the RV park when they came upon Scarface who was hidden behind a bush. When Scarface noticed them he charged them. My co-worker Barney yelled at the bear and he came to a stop about 8 feet from them. A very close encounter! It was witnessed by some of the other residence and I'm sure that quite a few of them broke out into a sweat watching the whole thing unfold. Scarface left the immediate area and the rangers had to come and discharge some blanks to scare him off further. I'm sure everyone in the RV park will be ultra careful when walking around. On Thursday as I was heading to Cody I came across an accident on Sylvan Pass. It looked as if a car rolled on the pass. Glass was all over the road and the car was in pretty tough shape. The ambulance was there and later I passed another heading to the site from Cody. On Tuesday night on my way home from Old Faithful I came across another accident. From the tire marks on the road it looks as if a bison was in the road and the car braked and skidded into the other lane. Yet again there was an ambulance and a wrecker there. Both are a reminder at how dangerous the driving conditions are here at times. Taking your eyes off the road or driving a little too fast can cause a vacation nightmare. On Friday night Carl took me to West Yellowstone to the IMAX to see the movie Yellowstone. He was all spiffy in his new pants and shirt. He even shined his shoes and bought us sandwiches. The movie was a lot of fun and Carl even put up with my browsing in a couple gift shops. After watching the movie previews I decided that I really need to see the movie Bears that they have there. They also have Alaska, which also looks very good. Carl left this morning. I had to work the early shift and he searched me out to say goodbye. We are all hoping that Carl will be able to make it back this year. Time will tell. Some people who read my blog stopped in the store Friday and said 'Hi' to me. I've also have been recieving e-mails from people ("Hello!" to all of you). The person who was in the bison charge in June sent me pictures that he had taken that evening. He got a few shots of the bison actually charging. I sent him a picture of the group I had taken and he was able to pick out his family in the picture. With Denise with me I left Minnesota last Saturday morning. We came into Yellowstone via the Beartooth Pass. I've been over the pass a few times before but each time is an experience. Being her first time west Denise was in awe of the beauty of the Beartooths. Once inside YNP we stopped in Lamar Valley, brought out my chairs and sat in a pullout eating sandwiches and watched (and listened) to a herd of bison while an antelope stood behind us across the road. Thinking that she had pretty much experienced everything we could fit into one day we both were amazed when we came across a grizzly by Chittenden Road as we started over Dunraven Pass. It was an incredible day, especially for Denise. On Sunday and Monday, during my breaks, I took Denise around to the sites around Canyon. Monday night I took her on the north loop where she saw her 2nd grizzly bear which was on Blacktail Plateau. Then we had a picnic and continued down to Old Faithful where she got a room at Old Faithful Inn. I left here there and headed back to Canyon as I had to work the next day. Tuesday night I returned to Old Faithful and stayed with her in a cabin. Wednesday we took off for the Tetons. Once again she was amazed at the beauty of the parks. We were on the look out for a moose but I checked both Moose Jct. and the Oxbow and were unable to find one. We did find a herd of bison and I snapped a few pictures of the herd with the Tetons as a backdrop. We stopped in Jackson Hole and bought a few shirts and then it was off to Jackson Hole Airport for her to catch her 5:00 flight. It was great to have an old friend here. This evening Carl and I went for a drive up Dunraven and saw a HUGE grizzly bear. I was upset with myself for not grabbing my 35mm (which I decided to use more often) but I did get a couple with my digital. Carl will have to leave on Sunday because of some issues back in Colorado. My hiking buddy and friend will hopefully be able to return yet this year. Time will tell......but I sure will miss him.